I was recently able to use a color temperature meter to test out a few flash units, thanks to the good folks at LightRein. It wasn’t a very scientific test, but I wanted to get some idea of the difference in color temperature between different shooting conditions. I initially wanted to do the test because I purchased an ABR800 despite reviews citing cheap build quality and wild color temperature variation. The build quality seems good enough for someone who isn’t risking a $50,000 on broken equipment. It’s true that the ABR800 itself is tough plastic, but its reflector accessories, including the Moon Unit, feel pretty janky. My impression after several months of use is that the parts are “sturdy enough” and that Paul C. Buff cut corners where it was the right idea to do so. It may feel like it’s going to break, but I now doubt I’ll break it. I should also note that my experience with their customer service was very positive. The reflector of my Moon Unit arrived damaged (the reflective surfaces were uneven), and the 20° grid had a very minor manufacturing problem. Their service rep was friendly, answered quickly, and sent me replacements right away. If you need your equipment to feel indestructible and withstand 12 foot drops, you can probably afford to buy a $2000 ring flash and its $3500 power pack. The ABR800 with a ton of useful accessories will set you back a mere $585.01, and if you’re moving up from battery powered flash units, you won’t be sorry. 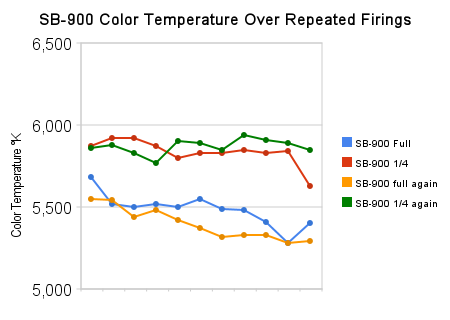 Build quality aside, I wanted to do some testing to put some real numbers on the complaints I’ve heard regarding color temperature variance. I’ll start with the SB-800 and SB-900. The keys in the charts below are hard to read, so here is the raw data, including charts, posted to Google Docs. I was surprised at how much the SB-800 and SB-900 jumped around. With more time, I would have done a lot more test firings to get a better idea of the variance. This is a relatively informal test. Still, a few things seem clear: the SB-900 and SB-800 perform differently. You’re going to get a colder pop out of the SB-900 than you’d probably want if you aren’t firing at full power. The SB-800 seems more centered around 5500 °K. The SB-800 can be had, used, for about $420 CAD. I saw them go for $450 CAD new at one point. The SB-900 is $550 CAD. The ABR800 on its own will set you back $400. You don’t get fancy optical remote control power like you do with a Nikon flash, but the color consistency is better than on the SB-800 and SB-900, and you get a lot more power. Still, this thing plugs into the wall, so if you want to go outside with it, you’re looking at a few more hundred bucks on something like a Vagabond II. I tested the ABR800 with the “Moon Unit” softbox attachment, and also with the modeling lamps on and off. 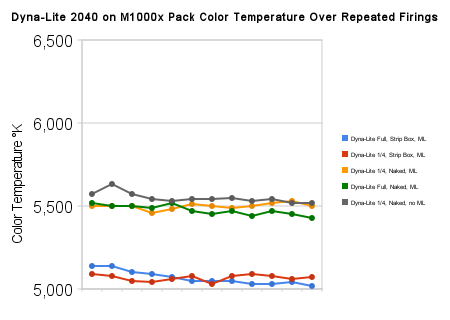 The reason for the latter test is that I’d heard that the modeling lamps caused color temperature variation problems. I left the lamps on for a long time before and during the tests labeled “ML”. It didn’t seem to make a significant difference. 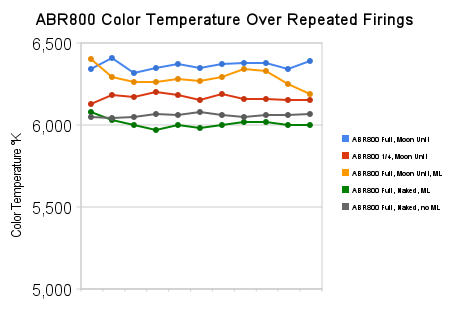 Sadly, the ABR800 is much cooler than the other units I tested. This could be a problem if you’re using it with other lights. 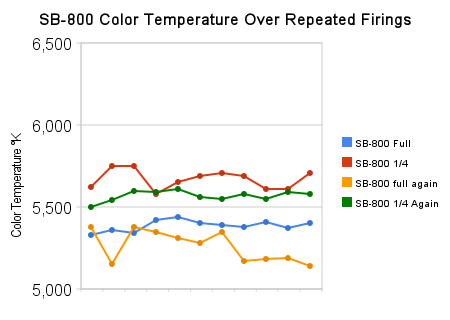 The AlienBees website says to expect the color temperature to be around 5500 °K, so I’ve sent an email asking if my results were normal. I’ll update this page when I’ve heard back. Still, I’m convinced it’s worth the money I paid. If you’re willing to spend thousands of dollars on new Dyna-Lite equipment, you will of course not be disappointed. My own Dyna-Lite strobes were relatively cheap because I got them used. Pro equipment tends to last forever. I was not surprised to see that between a 1000W/s blast (I felt like I was tanning a bit) and a 250W/s pop, the color temperature basically kept close to 5500°K. I was surprised that my 1’x6′ strip box made that much of a difference in the warmth. Take these results with a grain of salt: the room I was in has burgundy walls. Each light was fired from a different position in the room. The time between flashes was not consistent. The batteries in the SB-800 were starting to die, whereas the batteries in the SB-900 were fresh. This was not a rigorously scientific test by any means. At best, it provides some hints. I learned about Help-Portrait through a coworker. It is a North America-wide event where people including photographers, editors, and makeup artists get together to provide professional portraits to anyone for free. I was skeptical at first, but photographer and founder Jeremy Cowart’s intro video made it clear that a professional portrait session really makes people feel special. 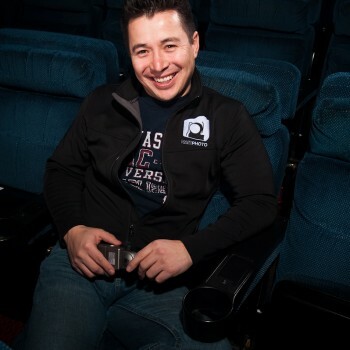 Javier Salazar (pictured) and Lillian Patz organized the Edmonton Help-Portrait event, which happens everywhere in North America in multiple locations per city. You may remember December 12th as having been Edmonton’s record-breaking coldest day, and that definitely had an impact on how many people showed up to do a portrait. In between clients, I snapped a few portraits of some of the great volunteers who came to help the photographers and hand out food and drinks to our clients, as well as the other photographer with whom I was swapping customers, Steve Osborne. There was even an outbreak of Edmonton’s Next Top Model fever. I’m really looking forward to doing this again next year. It’s a great event, and if you’d like to sponsor it, please let me know. Last night I got an opportunity to take part in the next The Force in the Flesh book, an ongoing project by Tattoo and Star Wars buff, Shane Turgeon. 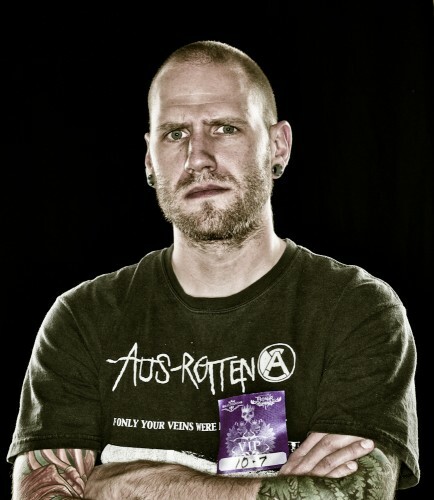 Bill Kelliher of Mastodon was scheduled to do a shoot with Curtis Comeau, but it was not to be. The shots worked out pretty well, though I felt like I could have spent a bit more time. I tried to keep the lighting on the tattoos consistent with what Shane showed me in the first Force in the Flesh book. I’ll sign off with a photo of Bill and Shane looking approximately 1000 times more badass than I ever will (each) and a lighting test shot with Shane. Kind thanks to Mike, Christine, Maya, Heather, Desiree, Colin, David, Jocelyn who assisted and modeled for the CJSR FunDrive 2009 photos. At any rate, the guerilla shoot went great, and a good time was had by all. 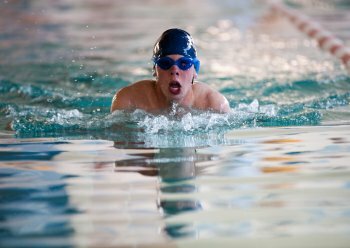 I shot the Alberta Special Olympics this weekend. I was happy with the shots I got, and will post some when I have authorization. You hear about how individuals with mental disabilities are inspiring, but it never clicks until you see an event like this. Watching these athletes put in that kind of work definitely makes you feel bad for any time you’ve ever put in less than 100% effort. All the athletes I spoke to were extremely pleasant, and they had a great time.